The first single from "RUOK?" is now available on 12" from Groove Tech. "What Does It All Mean?" comes with two new remixes and the album version and can be ordered by clicking here. The full length, RUOK? can be obtained here. New album means a brand new tee shirt is now available direct from the band! The new design is available both as a spiffy ringer and a cute girlie shirt. 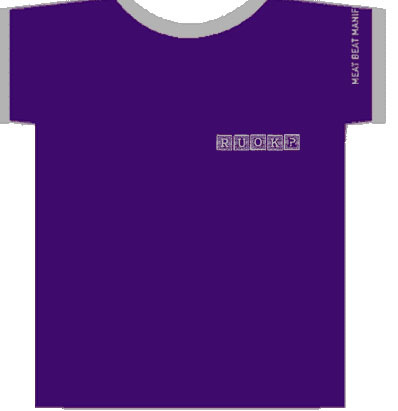 For ordering information and prices, see the material page. RUOK? is in stores now! The CD is available through Run Recordings in North America while the 2�LP version will be released through Skor on November 4th. Quatermass is releasing the CD and a single LP version in the UK and Europe. The North American CD contains bonus 3" mini CD called 'Free Piece Suite' with 3 new MBM tracks plus video of Tape Music. On the Radio: R.U.O.K? can be heard on college radio and rpm programs nationwide. Feel free to request tracks it at your local station. The second song to be previewed from the forthcoming album is called "Supersoul." The sound file is streaming in Real Media once again. To listen, click here. Black Mountain College will host "Microtable," a sound sculpture by Jack Dangers on Thursday, September 19th. From their web site, "the microtable combines both interests into a highly recognizable sculpture created to entertain not confuse. The Microtable is part of the Appliance Series." For more information, please see their Installations & Exhibitions web site at http://www.blackmountaincollege.org/festival/installations.html. We have obtained a streaming version of a new song off the forthcoming album titled "What Does it All Mean?" This track is one of two which features turntablist Z-Trip. The file is streaming in Real Media. To listen, click here. MBM R OK R U? Meat Beat Manifesto will be releasing a new record in October 2002 titled RUOK?.� The record represents a healthy growth in the innovative Meat Beat sound.� At first listen, the dense, dark layers of samples, breakbeats, and politically charged vocals that were the hallmark of previous MBM releases are noticeably stripped down.�The newfound sonic direction is a direct result of the equipment and setting Jack used in the recording of the new album. �The music was in part created in Jack's Bay area studio on an incredibly rare 1970's synthesizer unit called the EMS Synthi 100. R.U.O.K? collaborators include the turntablist-of-the-moment, Z-Trip, and ambient legend Alex Paterson of The Orb. ��Z-Trip, perhaps best known for his very listenable scratch/blend DJ sets that combine hip-hop and classic rock, lends his scratching ability to the very funky "What Does It all Mean?" & "Hankerchief Head".� Alex Paterson contributes on the eerie "Horn of Jericho." Never content to rest on his past achievements, Jack truly chose an adventurous path in the creation of R.U.O.K?, exploring new equipment, techniques, collaborations, and concepts. �And while the sound is still undeniably Meat Beat Manifesto, the album marks a distinct growth in this Jack's musical output. :\run recordings is proud to announce the signing of none other than MEAT BEAT MANIFESTO! 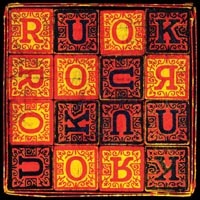 The new album titled R.U.O.K is set for an October release and features guests Alex Patterson of THE ORB and turntablist Z-TRIP. R.U.O.K. marks Meat Beat's first official studio album since 1998's critically acclaimed ACTUAL SOUNDS AND VOICES. MBM's seventh album represents a healthy growth in the innovative Meat Beat sound, and includes colloborations with turntablist of the moment, Z-Trip, and ambient legend Alex Paterson of The Orb. Album package includes special bonus 3"mini CD! 'Modern Mantra' is a new release on Shadow Records' Mix series and features Jack Dangers' "Zxero" (from 'Variaciones Espectrales') along with other tracks from Russell Mills/Undark, Sharpshooters, DJ Krush, Goo, Sneakster, Fugitive Elf, Saru, DJ Cam, Aesop Rock, Blend, Jack Dangers ("Zxero" - from Variaciones Espectrales ), Hanna, DJ Krush w/Toshinori Kondo, Cujo, Quentin's Ladder, Illform, Omicron, Nostramus, Obo, Droid, Spaceways, Shinju Gumi, Prototype 909, Terre Thaemlitz, and Moby. The disc is out now. On September 3rd, Important Records releases a new project by Merzbow called MERZBEAT which consists of 5 Masami compositions and a remix of "Amlux" by Jack Dangers. A second mix of that track by Jack is buried as the 66th track on the CD as a secret track following 60 bands of 3 second silence. UK Label, Bella Union created the Series 7 as the means to present a select set of the finest new instrumental music, each featuring 7 tracks produced in 7 days - ultimately numbering 7 CDs. The newest installment in this series is Jack Dangers' "Variaciones Espectrales" coming March 25th. Recorded in November 2001- these tracks provide a fresh reading of the ever evolving creative language configured by Jack Dangers - a moving set of �electro-fused beat explorations. "Variaciones Espectrales" releases stateside on Instinct Records. Series 7 initially launched with the self titled Gwei-Lo album, �followed by Rothko- " In the Pulse of an Artery" , Bonneville - "Pelican" and Departure Lounge - "Jetlag Dreams ". The conclusion of the series will see an extra CD featuring a bonus track from each artist and a film to accompany it and a collector's box for all 8 discs. �Bella Union is the �label �by Robin Guthrie and Simon Raymonde of the Cocteau Twins. For more information check out www.bellaunion.com. Gear up for MBM in game mode with the arrival of "Frequency", the new Sony Playstion 2 challenge which plugs each player into their own creative skill bank. Meat Beat Manifesto�s track, "Dynamite Fresh" is the musical stage for one of the trickier game levels in this remix-it strategy game whose source sounds are beat heavy and largely electro-fused. For more information, check out http://www.scea.com/games/categories/stratpuzzle/frequency/. Snaked from the Tino Corp web site, "Tino's Breaks Volumes 1 & 2 will make their triumphant return this April re-packaged as a single CD and in a limited re-pressing of both original vinyl discs. Bonus CD tracks include the previously unreleased Tino track, "Jazz Overboard" the video for which debuted and toured on the 2001 Resfest Festival in the Cinema Electronique program, an exclusive Tino remix by Faust & Shortee and the break-neck/break-speed remix by Golden Chyld vs Fuse 1 of "Exercise for the Left Hand". Also packaged on the CD is the mpeg-formatted video of "Tino's Drum Lessons". JACK DANGERS PROTO TRACKED ON "I LOVE SF"
Jack Dangers and DHS are both represented in the first volume of a new CD subscription series called Proto Tracks. Volume One gets straight to the heart of the San Francisco electronic music scene dedicating its tracking to exclusively Bay Area independent labels. Tino Corp selections are from D.H.S. in "Radio Safe" a version of this track to appear on the future D.H.S CD and the Jack Dangers track, "Al 13 " from his currently available 10" release, Tape Music (Flexidisc). Other labels featured on Proto Tracks debut volume, I (heart) San Francisco include: Asphodel, Exact Science, Future Primitive Sound, Imperial Dub, Om, Orthlong Musork Six Degrees, Tigerbeat 6 and Ubiquity. Further details at www.prototracks.com.